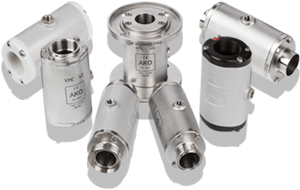 Crevice-free valves from AKO are available in various designs. 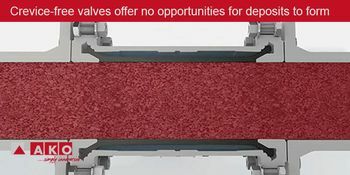 They are the ideal solution for preventing deposits inside the valve and outside the direct product flow. 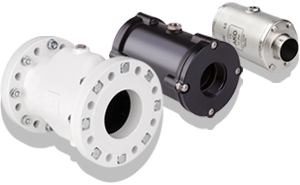 All valves from AKO are constructed in such a way that no components project into the direct product flow. In addition, no hollow spaces or undercuts exist in which the flowing material could collect. Especially in hygienically sensitive sectors like the food, pharmaceutical or chemical industry, this design prevents germs and bacterial from forming deposits in the undercuts and hollow spaces and growing in an uncontrolled manner. 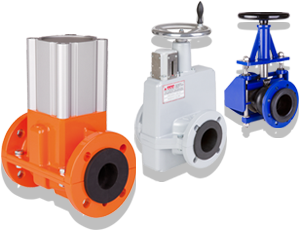 But even in branches of industry which materials that tend to encrust are transported, crevice-free valves are the ideal solution. 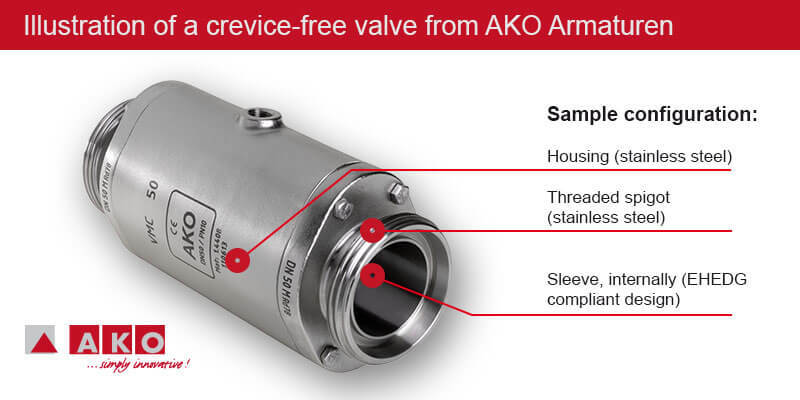 Enquire about your crevice-free valve with AKO Armaturen! 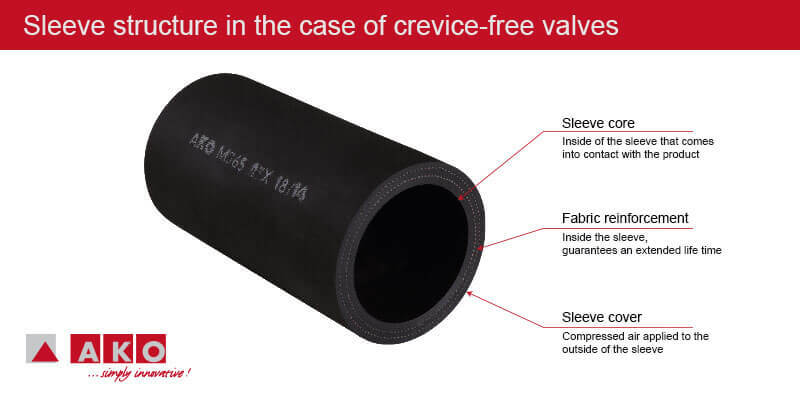 Crevice-free valves have special significance for interior sleeves since this component is an elemental part of the entire valve. It is decisive for the closing speed, closing density and constriction-free flow. 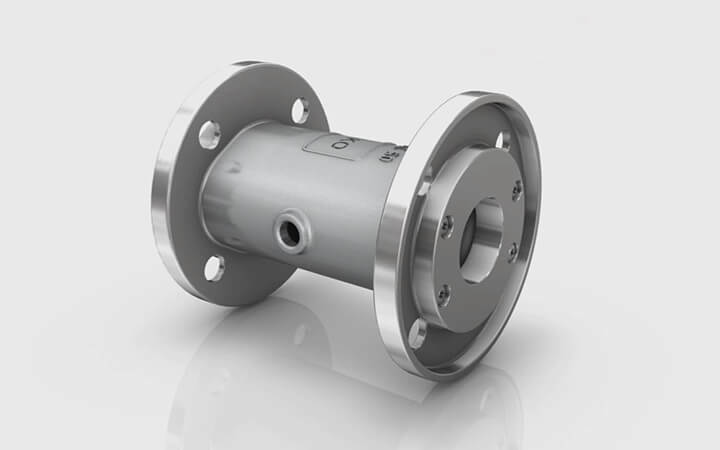 In addition, it is in direct contact with the transported material across the entire valve width. For this reason, AKO Armatures absolutely values high-quality elastomer compounds that make the sleeve into one of the most reliable and safe components in the entire valve. 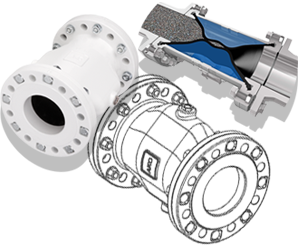 We produce the sleeves for crevice-free valves from various elastomers for different operating and transporting conditions. They always closed completely seal-tight and regulate or stop the transport of liquids and solids quickly and safely. 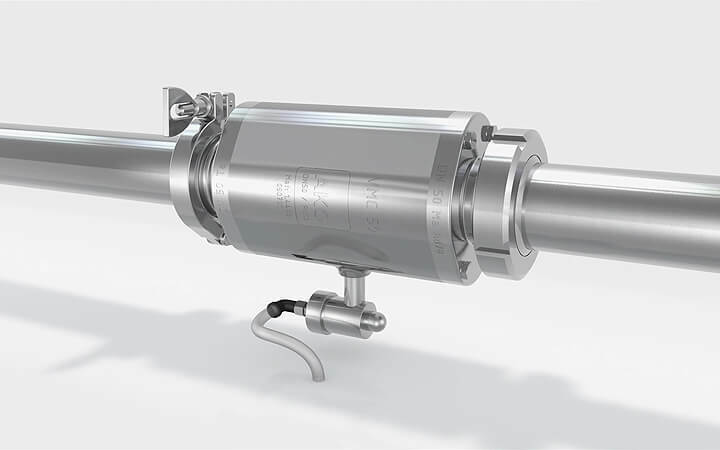 In combination with an electropneumatic proportional valve, even a coarse metering or regulation of the product flow can be achieved. The high abrasion resistance of the sleeves guarantee long service lives, as well as their elastic properties, which are not lost even in case of a high number of opening and closing procedures. In this way, you profit from larger maintenance intervals, fewer interruptions of your operating sequences and therefore considerably lower operating costs. The European Hygienic Engineering and Design Group (EHEDG) is an organisation of companies of the food industry, public health institutions and research institutes. This organisation sets guidelines for components used in sensitive areas in the food, pharmaceutical and chemical industries. The animation opposite shows the different cleaning and sterilisation procedures in a crevice-free valve. In case of any questions, please contact our Support team. The food industry, especially in areas in which liquids like syrup, sticky materials that are prone to adhesion or media that tend to clump are processed. The pharmaceutical industry, for example, for the transport of ingredients for tablets or viscous and/or liquid pharmaceutical preparations. The chemical industry, for example, in the processing of liquid or powder chemicals or their basic substances. All other branches of industry in which media that tend to encrust must be transported and regulated. Our Sales and Support team is happy to advise you! If you would like to find out more about crevice-free valves and our flexible modular system, please contact us. Describe your requirements to our experts to obtain optimum solution suggestions for your applications. We are happy to help. * By sending this inquiry, you declare your consent to the use of your data for processing and the establishment of contact according to our data protection declaration.